Kristin Posehn is a Los Angeles-based artist and writer who works with fragments of architecture. Her 2008 public artwork, Reclamation, was based on the facade of a school in the ghost town of Metropolis in remote northeastern Nevada. Metropolis was founded in 1910 as the state’s first master planned community, but by 1925 it was abandoned due to insufficient water rights. The only structure still standing is the brick-and- stone arch that was the school’s entrance. Posehn reconstructed the arch in wood at a 1:1 scale in Almere, the Netherlands, which she then clad in high-resolution color photographs of the original facade. The result was to dis-locate/re-locate the structure into a living context on the last undeveloped plot in the center of Almere. The elaborate but ephemeral work was dismantled and the surviving materials are now housed in the Center for Art + Environment Archive Collections. Posehn’s 2015 project A House Made of Air and Distance and Echoes was an architectural sculpture built by the artist and assistants on an abandoned airfield outside Vacaville, California. The work references the “Wedding Cake House,” a well-known example of “carpenter gothic” located in Kennebunkport, Maine. 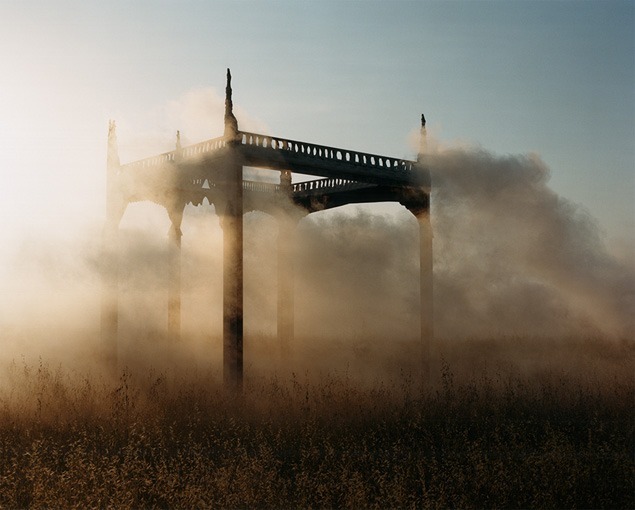 From this point of reference, Posehn “wiped away the house and manipulated its architectural frosting via digital process and hours of construction.” After completion of the piece in 2015, she photographed it, often in dense fog. Posehn–who is a sculptor, writer, and photographer–repositions architecture in the physical world so we can consider the relationships between built and natural environments, between art and architecture, between the real and the fictional. Posehn’s archive materials are part of the Center for Art + Environment’s investigation into the relationships among built and natural and virtual environments.